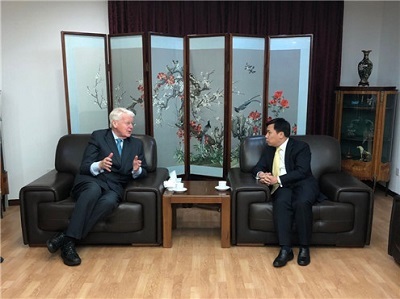 On February 1, Ambassador Jin Zhijian met with Mr. Olafur Ragnar Grimsson, Chairman of the Arctic Circle and Former President of Iceland. The two sides exchanged views on preparation on the Arctic Circle China Forum to be held in Shanghai this May. The Chinese Embassy in Iceland is willing to keep in close contact and work together with the secretariat to facilitate the coming Forum in Shanghai with due assistance and support.